I could wax on about how much Vegan MoFo 2008 has taught me: all the glories and riches of vegan cooking and community and challenges, but honestly, I’m too lazy to do that. It’s a beautiful day and I’ve got brownies to enjoy! When Deb posted these pumpkin swirl brownies from Martha Stewart (oh hey, it’s a MS theme this week! ), I knew they had to happen. Granted, baking brownies is like flipping pancakes for me. Try as I might, they never turn out right. And since I was out of every kind of egg replacer in my apartment except for Ener-G, I was locked into my least favorite option. Four eggs, Martha Stewart? Four eggs? Ugh. But I put my best whisk forward and somehow a slightly passable brownie turned out! The consistency of the first layer of chocolate wasn’t quite right, so it flaked off the bottoms of the brownies, but given that I baked them in an 8×8 inch dish instead of a 9×9 inch, the mongo thickness allowed for error. Overall, I love them! They aren’t too sweet and the pumpkin is a perfect compliment for the chocolate. If anyone else can veganize them better, go for it! I bet silken tofu or applesauce or a combination of both would work better as an egg replacer. Preheat oven to 350 degrees. Spray a 9-inch square baking pan or dish with vegetable oil spray. Cut a length of parchment that will cover the bottom and two sides (makes it much easier to remove), and line the pan with it. Oil the lining as well. Melt chocolate and Earth Balance in a heatproof bowl set over a pan of simmering water, stirring occasionally until smooth. Whisk together flour, baking powder, cayenne, and salt in a large bowl; set aside. Mix egg replacer with water in a large mixing bowl. Add sugar and vanilla and mix until well combined. Add flour mixture and mix until combined. Pour half of batter (about two cups) into a separate bowl and stir chocolate mixture into it. In other bowl, stir in the pumpkin, oil, cinnamon, and nutmeg. Transfer half of chocolate batter to prepared pan smoothing top with a rubber spatula. Top with half of pumpkin batter. Repeat to make one more chocolate layer and one more pumpkin layer. Work quickly so batters don’t set. I’m so tempted to try my hand at these, but I’ve just been too busy lately… Maybe in a week or two though! 23 posts is awesome, good job. Yeah I was also too lazy to write about all the goodnesses VeganMoFo has brought us and of course, I only cam here to enjoy your brownies! You did an EXCELLENT job with this year’s MoFo, Jes – be proud!! Oh these sound soooo good! 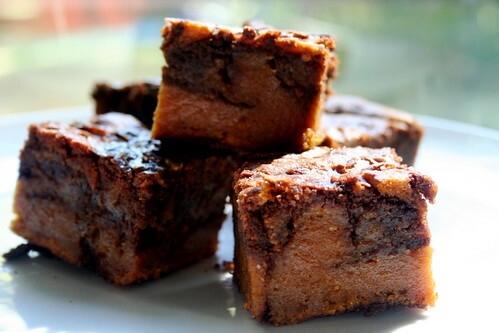 I haven’t made brownies in a while, might have to make these babies! They look AMAZING! Pumpkin and chocolate are such a great combo! they are so pretty! I’m betting they are really yummy. The brownies look so good! Awesome!! MMMMM. I love your idea of cutting them into smaller cubes. So simple. So brilliant!